Nearing 20 years after its theatrical release, Pulp Fiction stands as one of the most iconic films of all time. A discussion of great movies often begins at the very mention of Quentin Tarantino’s obscure masterpiece. With such a bizarre premise, plot, dialogue, and overall mood, Pulp Fiction is one-of-a-kind at the least and is argued by many to be the greatest movie ever made. The very image of Uma Thurman laying on the bed smoking is enough to force a smile upon the face of any whom have watched the film before. Pulp Fiction is known for doing many things better than any movie in history could do. In many areas, it was an absolute first for the world of film. And one thing it is known for is its winding and complex storyline. It ties together four unusual stories in an entirely original manner that only Tarantino could pull off. The story takes place in California’s San Fernando Valley and revolves primarily around two small-time hit men named Vincent Vega (John Travolta) and Jules Winnfield (Samuel L. Jackson) who work for a mob boss, Marsellus Wallace (Ving Rhames) and his wife Mia Wallace (Uma Thurman). This broad story also envelopes the life of a boxer (Bruce Willis) and his wife Fabienne (Maria de Medeiros), as well as a couple quite fond of robbing local stores (Tim Roth and Amanda Plummer), a drug dealer named Lance (Eric Stoltz) and his wife Jody (Rosanna Arquette), and one of Marsellus’ best men (Harvey Keitel). Quentin Tarantino himself makes a cameo. As mentioned earlier, Pulp Fiction does a phenomenal job of piecing together four bizarre storylines in an unusual way. These storylines fall together into place in a way that blows the viewer away. The first storyline depicts Vincent Vega’s watching over of the wife of his employer, Marsellus Wallace (Rhames). The second storyline tells of Vincent and Jules having committed a hit order by Marsellus and its aftermath. The third storyline depicts Marsellus Wallace paying Butch (Willis) to lose his boxing match and the events that follow it. The fourth tells of the pair of robbers (Roth and Plummer) holding hostage and stealing money from a diner that Vincent and Jules happen to be present in. This indescribably outstanding film sports an equivalently outstanding cast. Travolta, Jackson, and Thurman gave the movie’s best performances. They were nominated for Oscars for their roles as Vincent Vega, Jules Winnfield and Mia Wallace respectively. Surprisingly, Samuel L. Jackson did not win an Oscar for his exceptional performance. The scene where he and Vincent interfere with the diner bandits (Tim Roth and Amanda Plummer) and the scene where he recites the infamous biblical verse of Ezekiel 25:17 are known as some of the most memorable movie moments in history. In review: Pulp Fiction will go down as one of the greatest pieces of film in history. For those mature enough to watch it and appreciate the genius behind what they are viewing, it is a cinematic marvel. I have no complaints or criticisms for this film. Though it will always be among the greatest movies out there, parents should be well aware of the contents of this movie and view it prior to allowing their children to see it. 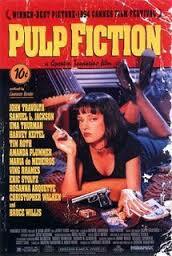 Pulp Fiction is jam-packed full of profane language, violence and blood, and drugs. With this in mind, it is clearly inappropriate for the population;s younger viewers. Though for a mature audience only, it is a definite piece of cinematic gold.